Six months after the Four Seasons Restaurant moved out of the Seagram Building and reopened on East 49th Street, a trio of developers dined before the lunch rush hour, digging into halibut soaked in mushrooms and vegetable pot-au-feu while sipping on $12 mineral water. 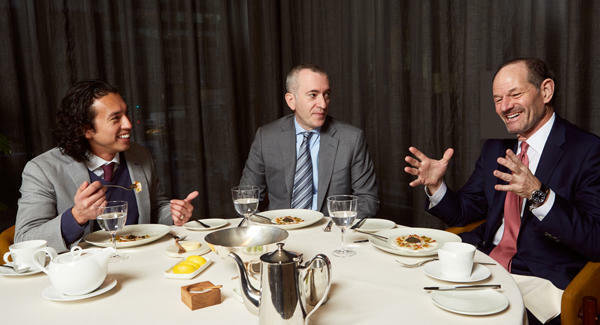 This was the setting of The Real Deal’s second “Power lunch” — a lively conversation with former governor-turned-developer Eliot Spitzer, Josh Schuster of Midtown-based Silverback Development and Matthew Messinger of the publicly traded investment and asset management firm Trinity Place Holdings. Spitzer and Schuster first crossed paths over 420 Kent Avenue, the site of a three-tower rental complex Spitzer Enterprises is building on the Williamsburg waterfront. The two met after Spitzer quietly plucked the deal out from under Schuster’s firm and bought the site from Rector Hylan Corp. for $165 million. Schuster: For nine months, we were chasing a deal for 420 Kent with a large REIT and negotiating a contract [with Rector Hylan]. In the 11th hour, I get a call on a Friday afternoon. I’m with my family, and the broker tells me Eliot Spitzer called and he increased the purchase price — and he’s wiring money tomorrow. I said, “We’re going into the weekend … There’s no way I can move that fast.” Lo and behold, Monday morning, they get the wire and sign the contract. Spitzer: All we did is say “Yes” [when the seller’s broker] called. Schuster: So, I call his office, and I’m fuming like a cartoon character. “I demand to speak to Eliot Spitzer!” He doesn’t call me back, but his longtime right-hand man, Charles Morisi, calls me and I’m yelling at him, “Do you know about this issue, this issue, this issue?” And he’s like, “Come in, let’s talk.” So, we bring in our stacks of diligence and set it all on the table, and over the next couple of months, we got to know each other. Schuster: They kicked me to the curb. But the relationship was worth it. Spitzer and Schuster said they’ve looked at opportunities in Greenpoint together. But concerns about absorption — Brookfield is building a 5,500-unit project there — and transportation issues in the neighborhood have kept them window shopping for now. Messinger said his firm has been focusing on distressed multifamily projects, particularly in the outer boroughs. Spitzer: Do you think the rents are going to rise faster than other people do, and therefore you can pay a bit more? Spitzer: What does that do for the underlying value of your company? Is the notion that you get to a certain scale and then get bought by Blackstone? Messinger: I do [these deals] like we’ll do them forever. Spitzer: So, you have Jon Gray’s number? The three also chatted about Amazon’s retreat from Long Island City. A few weeks prior, Silverback bought an under-construction rental property from Greystone Development, located just two blocks away from the proposed Amazon development. Schuster’s firm had paid $40 million for the property, at 24-16 Queens Plaza South, with plans to convert it into luxury condos. Those plans remain. Schuster: After hearing the news, that was a very depressing day for us. Spitzer: It’s over. It’s emblematic of a larger dynamic that’s going on right now, which is the desire for fairness, which is absolutely, 100 percent correct. [But that’s] overwhelmed any understanding of how you also simultaneously generate growth. I know the elected officials who were on the wrong side of this, and I’m disappointed in them. I think that it will go down as one of the worst decisions made. The discussion then turned to the prospect of various rent reforms, which state Democrats are pushing for, including eliminating vacancy decontrol and preferential rent. Messinger: I’m personally shocked that there hasn’t been more discussion about what is likely going to be the end game [for some landlords] come June or July. What’s being talked about as the core ask is insane. Spitzer: We are only recently at a point where we’re seeing an oversupply in the housing market in some sectors. How did that happen? It didn’t happen because the rules had been tightened. It happened because there was some latitude given to developers to invest, and it generated a 10-year boom in construction. Messinger: I’m surprised by how quiet [the debate over rent reform] is. This is potentially a time bomb.